Dinner Plans for Thursday the 30th? Great looking plate Steve. I'd especially like to dig into those bacon Collards. I have a chuck pot roast in my trusty Nesco roaster. My lunch bunch friends were raving about a Peperoncini pot roast and it's smelling great. Nothing to it really, just a packet of dry Ranch dressing, 1/2 cup strong beef stock, 1/2 cup sliced peperoncini and a stick of butter. Leftovers, but now, ironically, I have more leftovers than when I started. Im trying to figure out how I did that. I have one quite large poblano left in the fridge, so I am going to blister and skin it, stuff it with a rice, whipped cream-cheese, and shredded cheddar mixture, dip it in a beer batter, and deep fry it -- AKA, a chili relleno. I guess I could have just said I'm making a chili relleno. I didn't feel like cooking today, so dinner was just a pickin's plate. Had the last of the roasted red bell pepper hummus, a couple of different kinds of olives, salted radishes, sliced avocado, cherry tomatoes, smoked gouda, and a handful of whole wheat crackers for some salty crunch. Used up a lot of leftovers and cleared some room in the fridge, thank goodness. Iced tea with lemon to wash it all down, and will probably have a bowl of chocolate peanut butter ice cream later on. 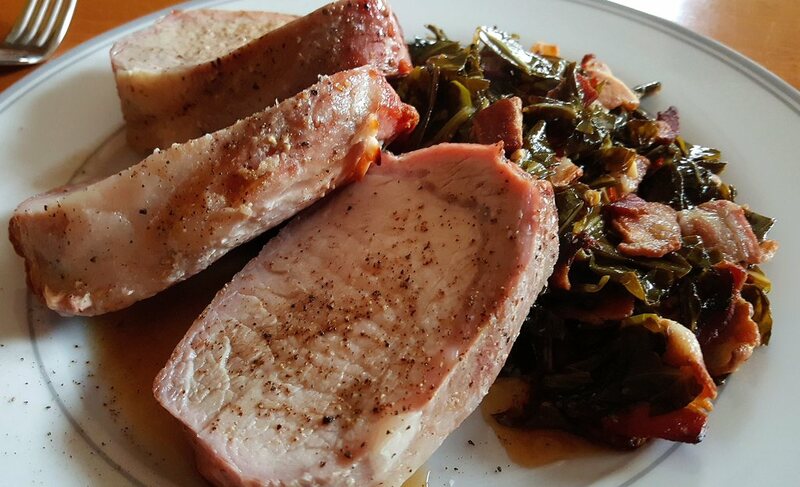 Pork Loin Roast and Collard Greens. Same here, Ross. I'm always inspired by what I read here. My chili relleno was somewhat disappointing. The stuffing was good, and the batter was good, and I cooked it well... but the poblano I used was tough, weak in flavor, and had no heat whatsoever. Peppers can be a roll of the dice. Even the ones I grow myself. My early season jalepeños tend to be very mild, but I've harvested some in October that nearly blew the top off of my head off. I'm glad you liked the sound of it too Ross. It turned out uniquely flavorful and super easy. I served it with mashed potato with the simple pan juices, and steamed broccolini. I really like Peperoncini, and I may use a little more next time. Casey, if you love chiles rellenos and would possibly be interested in a casserole version, you might like this thread.